"Cis-trans" redirects here. For other uses, see Cis (disambiguation). Cis–trans isomerism, also known as geometric isomerism or configurational isomerism, is a term used in organic chemistry. The prefixes "cis" and "trans" are from Latin: "this side of" and "the other side of", respectively. In the context of chemistry, cis indicates that the functional groups are on the same side of the carbon chain while trans conveys that functional groups are on opposing sides of the carbon chain. Cis-trans isomers are stereoisomers, that is, pairs of molecules which have the same formula but whose functional groups are rotated into a different orientation in three-dimensional space. It is not to be confused with E–Z isomerism, which is an absolute stereochemical description, and only to be used with alkenes. In general, stereoisomers contain double bonds that do not rotate, or they may contain ring structures, where the rotation of bonds is restricted or prevented. Cis and trans isomers occur both in organic molecules and in inorganic coordination complexes. Cis and trans descriptors are not used for cases of conformational isomerism where the two geometric forms easily interconvert, such as most open-chain single-bonded structures; instead, the terms "syn" and "anti" would be used. The term "geometric isomerism" is considered by IUPAC to be an obsolete synonym of "cis–trans isomerism". When the substituent groups are oriented in the same direction, the diastereomer is referred to as cis, whereas, when the substituents are oriented in opposing directions, the diastereomer is referred to as trans. An example of a small hydrocarbon displaying cis–trans isomerism is but-2-ene. Cis and trans isomers often have different physical properties. Differences between isomers, in general, arise from the differences in the shape of the molecule or the overall dipole moment. These differences can be very small, as in the case of the boiling point of straight-chain alkenes, such as pent-2-ene, which is 37 °C in the cis isomer and 36 °C in the trans isomer. The differences between cis and trans isomers can be larger if polar bonds are present, as in the 1,2-dichloroethenes. The cis isomer in this case has a boiling point of 60.3 °C, while the trans isomer has a boiling point of 47.5 °C. In the cis isomer the two polar C-Cl bond dipole moments combine to give an overall molecular dipole, so that there are intermolecular dipole–dipole forces (or Keesom forces), which add to the London dispersion forces and raise the boiling point. In the trans isomer on the other hand, this does not occur because the two C−Cl bond moments cancel and the molecule has a net zero dipole (it does however have a non-zero quadrupole). The two isomers of butenedioic acid have such large differences in properties and reactivities that they were actually given completely different names. The cis isomer is called maleic acid and the trans isomer fumaric acid. Polarity is key in determining relative boiling point as it causes increased intermolecular forces, thereby raising the boiling point. In the same manner, symmetry is key in determining relative melting point as it allows for better packing in the solid state, even if it does not alter the polarity of the molecule. One example of this is the relationship between oleic acid and elaidic acid; oleic acid, the cis isomer, has a melting point of 13.4 °C, making it a liquid at room temperature, while the trans isomer, elaidic acid, has the much higher melting point of 43 °C, due to the straighter trans isomer being able to pack more tightly, and is solid at room temperature. Thus, trans alkenes, which are less polar and more symmetrical, have lower boiling points and higher melting points, and cis alkenes, which are generally more polar and less symmetrical, have higher boiling points and lower melting points. In the case of geometric isomers that are a consequence of double bonds, and, in particular, when both substituents are the same, some general trends usually hold. These trends can be attributed to the fact that the dipoles of the substituents in a cis isomer will add up to give an overall molecular dipole. In a trans isomer, the dipoles of the substituents will cancel out due to being on opposite sides of the molecule. Trans isomers also tend to have lower densities than their cis counterparts. As a general trend, trans alkenes tend to have higher melting points and lower solubility in inert solvents, as trans alkenes, in general, are more symmetrical than cis alkenes. Vicinal coupling constants (3JHH), measured by NMR spectroscopy, are larger for trans (range: 12–18 Hz; typical: 15 Hz) than for cis (range: 0–12 Hz; typical: 8 Hz) isomers. Usually for acyclic systems trans isomers are more stable than cis isomers. This is typically due to the increased unfavourable steric interaction of the substituents in the cis isomer. Therefore, trans isomers have a less exothermic heat of combustion, indicating higher thermochemical stability. In the Benson heat of formation group additivity dataset, cis isomers suffer a 1.10 kcal/mol stability penalty. 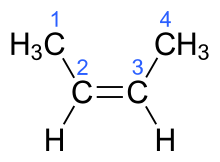 Exceptions to this rule exist, such as 1,2-difluoroethylene, 1,2-difluorodiazene (FN=NF), and several other halogen- and oxygen-substituted ethylenes. In these cases, the cis isomer is more stable than the trans isomer. This phenomenon is called the cis effect. The cis–trans system for naming alkene isomers should generally only be used when there are only two different substituents on the double bond, so there is no confusion about which substituents are being described relative to each other. For more complex cases, the cis/trans designation is generally based on the longest carbon chain as reflected in the root name of the molecule (i.e. an extension of standard organic nomenclature for the parent structure). The IUPAC standard designations E–Z are unambiguous in all cases, and therefore are especially useful for tri- and tetrasubstituted alkenes to avoid any confusion about which groups are being identified as cis or trans to each other. Z (from the German zusammen) means "together". E (from the German entgegen) means "opposed" in the sense of "opposite". That is, Z has the higher-priority groups cis to each other and E has the higher-priority groups trans to each other. Whether a molecular configuration is designated E or Z is determined by the Cahn-Ingold-Prelog priority rules; higher atomic numbers are given higher priority. For each of the two atoms in the double bond, it is necessary to determine the priority of each substituent. If both the higher-priority substituents are on the same side, the arrangement is Z; if on opposite sides, the arrangement is E.
Because the cis/trans and E–Z systems compare different groups on the alkene, it is not strictly true that Z corresponds to cis and E corresponds to trans. For example, trans-2-chlorobut-2-ene (the two methyl groups, C1 and C4, on the but-2-ene backbone are trans to each other) is (Z)-2-chlorobut-2-ene (the chlorine and C4 are together because C1 and C4 are opposite). Cis–trans isomerism can also occur in inorganic compounds, most notably in diazenes and coordination compounds. Diazenes (and the related diphosphenes) can also exhibit cis/trans isomerism. As with organic compounds, the cis isomer is generally the more reactive of the two, being the only isomer that can reduce alkenes and alkynes to alkanes, but for a different reason: the trans isomer cannot line its hydrogens up suitably to reduce the alkene, but the cis isomer, being shaped differently, can. In inorganic coordination complexes with octahedral or square planar geometries, there are also cis isomers in which similar ligands are closer together and trans isomers in which they are further apart. For example, there are two isomers of square planar Pt(NH3)2Cl2, as explained by Alfred Werner in 1893. 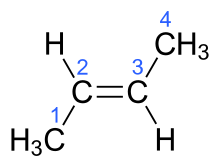 The cis isomer, whose full name is cis-diamminedichloroplatinum(II), was shown in 1969 by Barnett Rosenberg to have antitumor activity, and is now a chemotherapy drug known by the short name cisplatin. In contrast, the trans isomer (transplatin) has no useful anticancer activity. Each isomer can be synthesized using the trans effect to control which isomer is produced. For octahedral complexes of formula MX4Y2, two isomers also exist. (Here M is a metal atom, and X and Y are two different types of ligands.) In the cis isomer, the two Y ligands are adjacent to each other at 90°, as is true for the two chlorine atoms shown in green in cis-[Co(NH3)4Cl2]+, at left. In the trans isomer shown at right, the two Cl atoms are on opposite sides of the central Co atom. A related type of isomerism in octahedral MX3Y3 complexes is facial–meridional (or fac/mer) isomerism, in which different numbers of ligands are cis or trans to each other. Metal carbonyl compounds can be characterized as "fac" or "mer" using infrared spectroscopy. ^ Reusch, William (2010). "Stereoisomers Part I". Virtual Textbook of Organic Chemistry. Michigan State University. Retrieved 7 April 2015. ^ "Chemicalland values". Chemicalland21.com. Retrieved 2010-06-22. ^ CRC Handbook of Chemistry and Physics (60th ed.). 1979–80. p. C-298. ^ a b March, Jerry. Advanced Organic Chemistry, Reactions, Mechanisms and structure (3rd ed.). p. 111. ISBN 0-471-85472-7. ^ Williams, Dudley H.; Fleming, Ian (1989). "Table 3.27". Spectroscopic Methods in Organic Chemistry (4th rev. ed.). McGraw-Hill. ISBN 007707212X. ^ Bingham, Richard C. (1976). "The stereochemical consequences of electron delocalization in extended π systems. An interpretation of the cis effect exhibited by 1,2-disubstituted ethylenes and related phenomena". J. Am. Chem. Soc. 98 (2): 535–540. doi:10.1021/ja00418a036. ^ Craig, N. C.; Chen, A.; Suh, K. H.; Klee, S.; Mellau, G. C.; Winnewisser, B. P.; Winnewisser, M. (1997). "Contribution to the Study of the Gauche Effect. The Complete Structure of the Anti Rotamer of 1,2-Difluoroethane". J. Am. Chem. Soc. 119 (20): 4789. doi:10.1021/ja963819e. IUPAC definition of "geometric isomerism"
IUPAC definition of "cis–trans isomers"